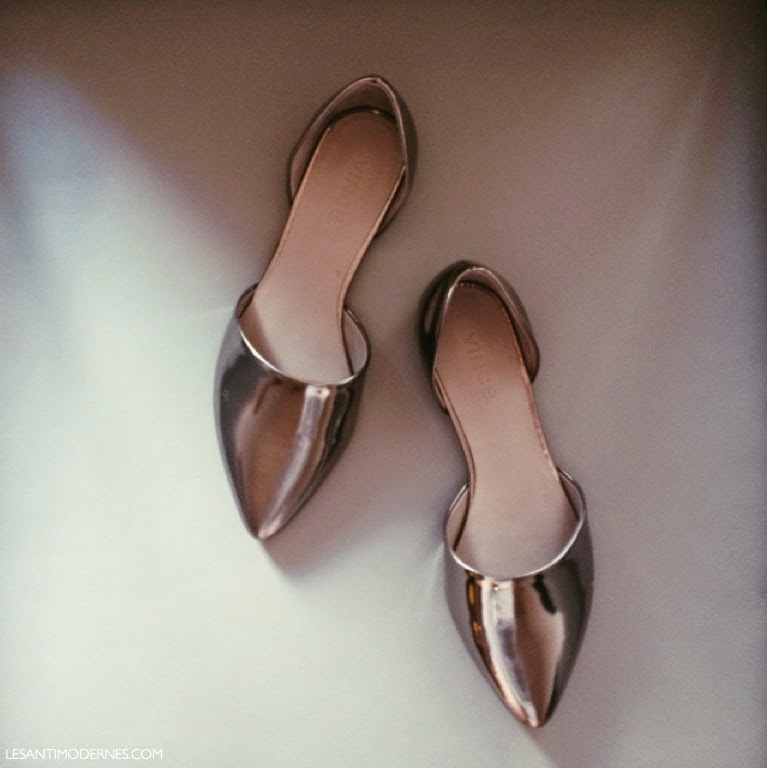 i was pretty thrilled to scoop up these Vince d'orsay flats on sale. d'orsays are suddenly everywhere right now, but i do think these have staying power. since i'm always interested in a dressed-up take on a flat, these are the perfect finishing touch to my basic uniform. the leather / workmanship: the all-leather construction is quite sturdy and the shoe has a nice, substantial feel, which was what i was looking for. delicate slippers these are not; they feel like they will stand up to the mean streets of NYC. the fit: slightly inconsistent from style to style – i think this is the one weak point of Vince's otherwise beautifully designed shoe collection. the d'orsay flats do run a half size large, so i took these in a 6 (i'm usually a US 6.5/EU 37). i have narrow heels, but didn't have any heel slippage in the 6. i was also concerned that these may run wide, but i found the fit to be just right once i went down half a size. the look: love. i also tried on the black and camel versions, and if i had the budget i would have bought all three. minimal and sophisticated with an edge. the style is definitely work-appropriate and would transition well from day to night, and are comfy enough for weekends too! worth it? yes – especially if you prefer flats over heels. i can see these becoming a staple for seasons to come. what do you think? do you have d'orsays? They are a lovey sleek shape and are still elegant enough for more formal events. The suede, though, make them less of a workhorse type of shoe, of course. Actually I'm loving the t-shirt! I have a pair of black jelly sandals with a big camellia on them. I've learned the hard way they're horrible for the rain. I really love this style and they look wonderful on you! Totally agree that they're going to have staying power. I ordered a pair but there were too narrow across the front so I think the challenge for me would be to find wide fitting versions. It makes me very happy indeed that there are more and more variety in styles of flats available nowadays. I think you're the one who introduced me to the d'Orsay flats awhile ago. 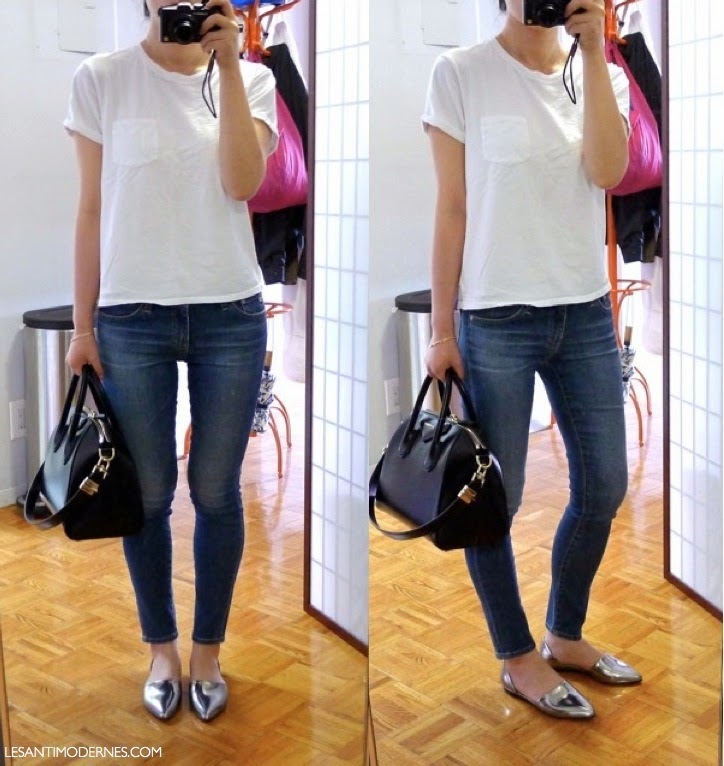 I really like their retro shape and the metallic is a lovely catch and touch for casual outfits!